This article introduces two approaches for modelling the dependency of the optimal portfolio choice on the available amount of investment volume from the perspective of socially responsible investors who seek both financial and ethical benefits. We complement the expected utility framework and the mean-variance portfolio selection model by a sustainability dimension to account for the additional utility that investors derive from the social attribute of the investment. By using a numeric example, we illustrate how the optimal investment choice changes depending on the initial wealth and the investor’s appreciation of sustainable and responsible objectives. The applicability of the proposed models is shown by an actual investment case. We thank an anonymous referee for valuable suggestions and the Fritz Thyssen Stiftung, which provided financial support for the project ‘Spezielle Aspekte der Berücksichtigung von Nachhaltigkeit in der Anlageentscheidung’. 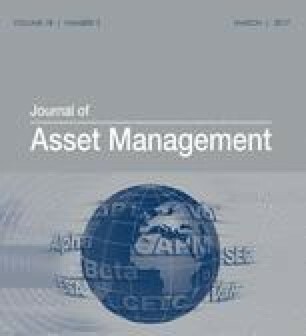 Bilbao-Terol, A., Arenas-Parra, M., Canal-Fernandez, V. and Bilbao-Terol, C. (2015) Multi-criteria decision making for choosing socially responsible investment within a behavioral portfolio theory framework: A new way of investing into a crisis environment. Annals of Operations Research. doi: 10.1007/s10479-015-1947-9. Calvo, C., Ivorra, C. and Liern, V. (2014) Fuzzy portfolio selection with non-financial goals: exploring the efficient frontier. Annals of Operations Research. doi: 10.1007/s10479-014-1561-2. Chatterji, A., Durand, R., Levine, D. and Touboul, S. (2015) Do ratings of firms converge? Implications for strategy research. Strategic Management Journal. doi: 10.1002/smj.2407. Semenova, N. and Hassel, L.G. (2014) On the validity of environmental performance metrics. Journal of Business Ethics. doi: 10.1007/s10551-014-2323-4.